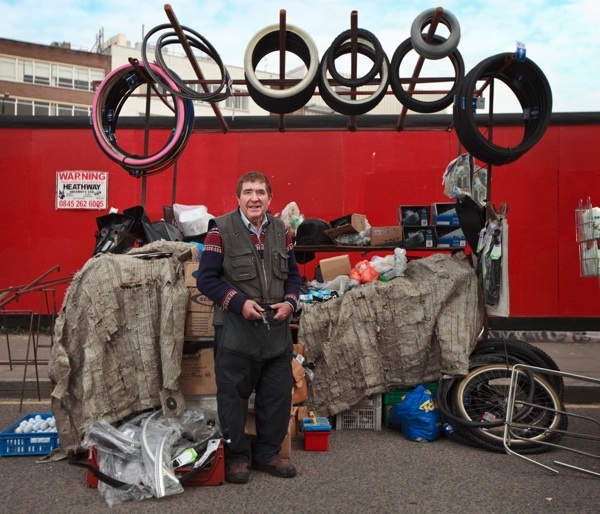 Henry William Lee began selling bicycles from a stall in Sclater St each Sunday in the eighteen eighties, a trade carried on by his son Henry George Lee and – a hundred and thirty years later – his grandson Richard Lee still continues to do good business there today. A remarkable feat in the apparently transient world of the street market, making Richard the stallholder with the longest continuous business in Brick Lane, by far. “My dad was born into it in 1913, died at eighty-six, and he was here ’til the end,” recalls Richard, “I first came down here when I was five, and I was thirteen when I started working on the stall.” With a vital spirit, thick ginger hair and a constant expression of eagerness, Richard is commonly to be seen in front of his stall in Sclater St with his oily hands wrapped around his body and tucked into his armpits, rocking back and forth on the balls of feet, in readiness for the next customer. “People know me,” he declares, “I was selling to them when they were kids and now I’m selling to their kids. I don’t tuck anybody up, I sell quality stuff and I sell it cheap.” Even as he spoke, cyclists of all ages were arriving – children included – pulling up and balancing on their bikes to ask, “How much for coloured tyres?” – “Any back wheels?” – and “How much are your D -locks?” And Richard has an answer for everyone off the top of his head, reaching back into the organised chaos of his stall, where everything is miraculously no further than arm’s length, to produce straight handlebars or brake calipers or anything else that might be required, cyclewise. It was no surprise to learn that his son Ray is a magician because there is an aura of the conjurer about Richard ‘s performance – producing the unexpected with an ease that denies his expertise. “I’m due to retire but I can’t afford to retire,” he pleads with a smirk, “I do a sixteen hour day. It’s not easy getting up at four and then when you go home, there’s all the bookwork.” Yet I was unconvinced by Richard’s entreaty, because it gives him such visible pleasure to be in the spot where his father and grandfather were before him – even in a street that has changed beyond all recognition – and I hope we shall see him there for many years to come, because this is the longest running show on Brick Lane. This is Jeremiah, an artist, and her friend Alan, a psychologist, who sell art and antiques, trading as Crazy Horse Collectibles. “It’s my business but Alan helps me out,” explained Jeremiah, flashing her dark eyes and tossing her red curls proudly, “We’ve been at it for a year and a half, and since we came here it really took off.” Jeremiah was speaking from behind a line of tables stacked with all kinds of weird and wonderful paintings and kitschy figures that were attracting a fascinated crowd. 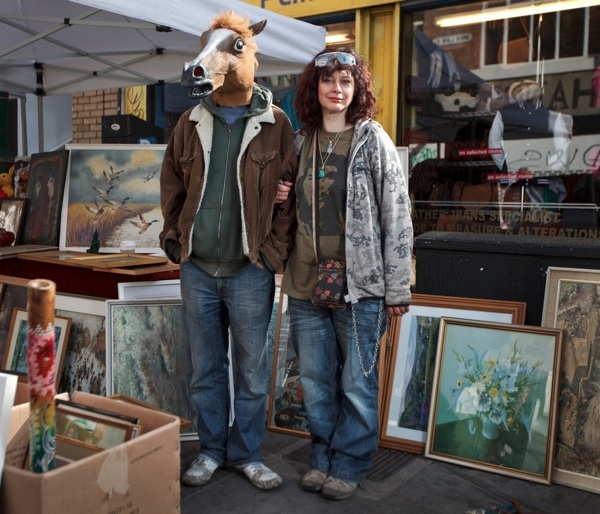 “I had to get out of dire financial difficulties and Alan reached the point where he couldn’t get into his flat because of the collectibles,” she confessed in whisper, “so we both needed to offload stuff in Brick Lane, and it’s all come about in a spontaneous hippy way.” Then, not to be outdone, Alan removed his horse’s head and gave his estimation of their endeavour, “Jeremiah ‘s stuff is ‘fine art and collectibles’ while I call mine,”obscenities and corruptibles.’” he announced with a broad smile, rolling his eyes provocatively. “In other words antiques over here and junk over there!” Jeremiah retorted, pointing in Alan’s direction. I really like your portraits of people around Spitalfields. 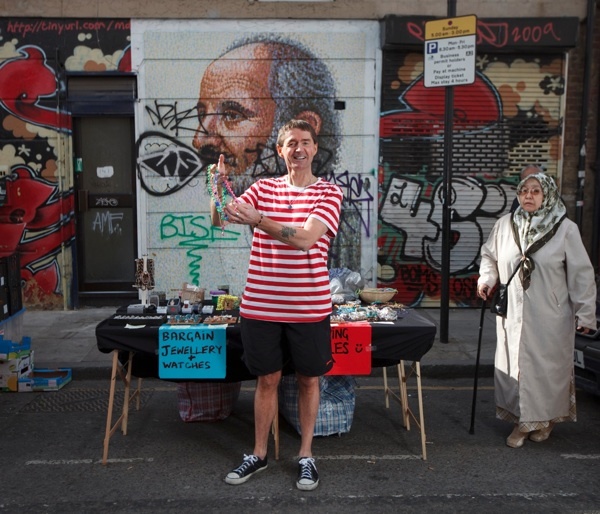 Spitalfields, which is lively anyway, comes to life in another way in your blog. Thanks for that! He was feeling a little horse this morning, sounded like he was coming down with a colt. Cute couple, wonder if they met at a stag party? Thanks for telling me about Henry’s stall, just what I needed when I discovered on a Saturday evening that my bicycle’s brakes were broken!